All of our classes are available as a single class (3 hours) or a course of 3 or more classes. A discount of 10% is given to those who wish to take a course of 3 or more classes. Classes run from 10.30am - 1.30pm from Monday to Saturday. Please click on the images or text below to be redirected to your page of interest. These classes are suitable for everyone. You can take just one 3 hour class if you like, or a short course of three classes – total 9 hours, you will be inspired to create...read more. You can learn the basics of Steiner color theory in one 3-hour class. Many people start with one class and go on to take a short course of 3 classes, that is, 9 hours. Some people...read more. Color can be extremely therapeutic to work with creatively and at BCAC this is the most popular approach. But drawing: line, shape, form, all kinds of painting, e.g., acrylics...read more. Bring the whole family to BCAC and enjoy creating art and developing art skills together. 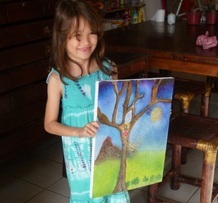 We do specific art activities in charcoal, pastels, water colours...read more. Children just love to create, they don't have the same blockages that adults have concerning talent, flair or artistic skills, they just jump in and do what comes naturally. They learn to see, explore, and experiment...read more. There is a 10% discount on the single class price for courses of 3 or more classes. applies to the total number of classes based on the single class price. Payment is in IDR cash at the end of a single class. Payment for a full course of, e.g., 3 classes is also at the end of the first class. At this point we arrange dates for the remaining classes. The dates can be flexible and changed with one day advance notice. For courses of 3 or more classes booked 10 or more days in advance, we require a 50% deposit to secure the course. BCAC offers a variety of ‘OUTREACH’ or ‘EXTENDED STUDY’ study programs, especially to international and national plus schools from around the Asia Pacific region...read more. The course will provide an inspiring and highly informative preparation for students about to undertake an IB Diploma Program Visual Arts course at a school, or...read more. Bruce Sherratt runs private workshops and Presentations at International Schools around the world. This invaluable tool can assist students in their endeavor to hone...read more. BCAC runs university credit courses mainly for educators – three credits awarded by the International Program for Educators, Buffalo State – SUNY – University of New York...read more. At BCAC there are classes that combine visual expressive arts with, for instance, creative writing, yoga, meditation, making ceremonial offerings and healing or therapeutic massage. In addition to the instruction given by me, participants also have the chance to work with Balinese artists based here at the center. Underpinning our philosophy and approach is the firm belief that art is available to everyone; that you need no special talent or gift to create art, and that the creative process depends on learning and practicing a series of skills that, given the right circumstances, are accessible to everyone. The idea that creating excellent, worthwhile art is possible only for a gifted few is a myth that is turned on it’s head every day at BCAC. Here, everyone succeeds. In addition to acquiring hands-on creative skills, the experiences offered at BCAC lead to a deep appreciation and understanding of the visual arts in general. Participants of all ages discover, not just more about themselves, they also become more receptive to various kinds of art. After deeply submerging themselves in an intensely artistic environment and culture, participants invariably appreciate art more deeply and fully. Appreciating art is not necessarily the same as liking art however. It has more to do with understanding art. Participants at BCAC grow to appreciate a wide range of artistic expression and the place of art in the context of history and culture. Colour is studied from the perspective of Rudolf Steiner’s color theory. Through a series of exercises carried out in various media participants learn to submerge their own ego and identity in specific colors and color harmonies. This leads to a greatly enhanced sensitivity to color and a dramatic increase in technical and artistic skills. 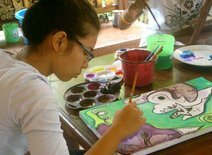 Participants rapidly discover that they can create extraordinarily creative and original art of their own. The business of drawing real things as they appear is a major challenge for most people. Many think they can never master this skill, mainly due to bad teaching and an educational system that does not value or effectively promote this ability. A great many people lack confidence or the will to even try, due to a negative self-assessment that has been with them since childhood. The abstract realm of none representational art offers a visual language that is immediately available to all. Using media such as charcoal, pastels, inks and paint participants acquire the skills needed to express a range of themes, sensations, natural phenomena, truths and emotions through an abstract visual language that transcends national and cultural identities and boundaries. Such experiences are presented in a Balinese context. In addition to course presentations, gallery and studio visits ensure participants gain a deep appreciation of contemporary Balinese abstract painting and sculpture and their relation to Balinese traditions and beliefs. Betty Edwards’ revolutionary brain research has given us a logical, step-by-step method that makes drawing available to all. ”If we can see we can draw.” That is the only requirement. Betty Edwards’ ‘right side of brain’ approach to drawing takes us through a series of experiences leading to alternative ways of looking at objects. These strategies for seeing things as they really are lead invariably to increased drawing skills. You will learn about realism in the Balinese art historical context, visiting the two major museums in Ubud. Here you will witness outstanding examples of drawings and paintings by the first, mainly realist and impressionist European artists to settle in Bali. You’ll discover the extraordinary influence these artists had on the development on contemporary Balinese painting, as well as the impact this exotic ‘Island of the Gods’ had on their work and lives.